Four members of our King's-Edgehill wrestling team spent the first day of their Christmas break competing at the Annual Hants East Wrestling Tournament on Saturday, December 15th. Quinn Emery, Camryn Kleynhans, Callum Lovelace, and David McCurdy made time during the busy examination schedule to prepare for this optional tournament. Quinn, returning very strong from last season after spending a lot of time training in the weight room in the interim, competed through discomfort in his shoulder to win third place in a tough class. Camryn, a returning provincial champion, won GOLD in a best two out of three series against a seasoned opponent. She could have taken first place in two matches, but she took this opportunity to try new moves and wrestle a more technical style. David, a brand new wrestler, lent his considerable fitness, intellect, and power to his fledgling technical skills to compete in a very tough bracket with five other competitors, all of whom were bigger than him. We are confident that David, with lots more work, will dominate the Senior boys' 100 kilogram class. Callum wrestled an extremely aggressive style against very talented opposition, but he was pulled from competition after an injury. We are confident that the success our small selection of wrestlers had in Hants East is but a minor prelude to the success our entire team will have at our 23rd Annual Wrestling Tournament at King's-Edgehill on January 19 and beyond. King's Edgehill School coaches understand that some students thrive as part of a team, while others prefer to compete individually to improve their personal bests. We value both types of competition. 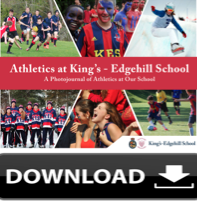 Download our Athletics PhotoJournal to discover more about our athletics programme.